The evening kicked off with an amateur kickboxing bout featuring Shaena Cox and Ricarda Gomes. 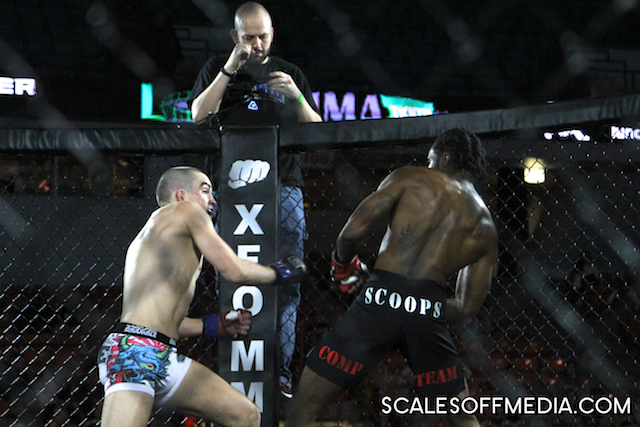 From the opening bell to the closing seconds of the match, these two worked at an absolutely breakneck pace. 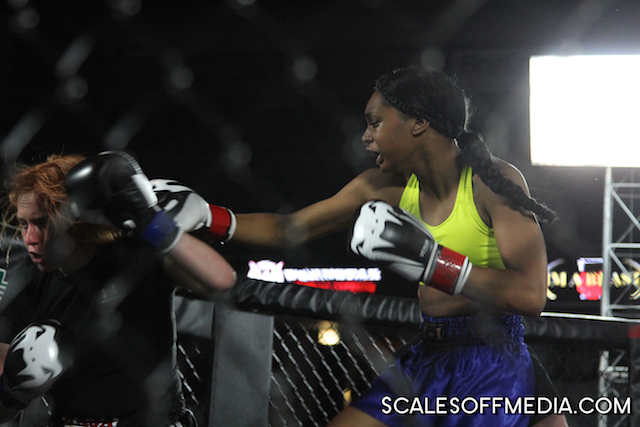 Although both women landed significant strikes in volume throughout the fight, Cox was able to use her reach effectively and land shots up the middle, which would ultimately be the difference maker on the judges’ scorecards. This was about as close of a decision as a fight could be, as both men expended a lot of energy in the opening rounds feeling each other out and working in the clinch. Umar proved, though, that leg kicks do in fact win fights; he landed a massive kick to the lead leg of DeCicco that buckled him to the canvas to close the first round and continued to chop away throughout the second frame. DeCicco did well to circle away from eating those kicks in the third, but it was too little too late, as Umar came away with the unanimous decision. During Sommers walk to the cage, DMX blared in the background, reminding everyone that “one minute [he’s] cool, the next minute [he’s] up on ya, rippin.” Sommers clearly took his walk out music choice to heart, sending Michael Hayden to the canvas just seconds into the opening stanza. Sommers followed a stiff leg kick with a short, hard hook that caught Hayden flush on the jawline and brought their meeting to an abrupt end. Shapiro came out showing a real herky-jerky approach on his feet, quickly cycling between level changes and shifty angles; however, Rodriguez did well to remain composed. Midway through the first round, however, Shapiro was able to find an opening to drop into a nice double leg. Once the fight hit the mat, Shapiro gave a textbook example of Carlson Gracie Jiu Jitsu in action. Rodriguez went for a heel hook that gave Shapiro the opportunity to roll through the attack, turn into his opponent, and transition smoothly into an extremely heavy full mount. Rodriguez effectively controlled Shapiro’s posture momentarily, but as soon as he postured up and let his hands go from the mount, it was only a matter of time before Rodriguez was forced to tap to unanswered strikes. MMA may be an individual sport, but effective coaching can make all the difference. 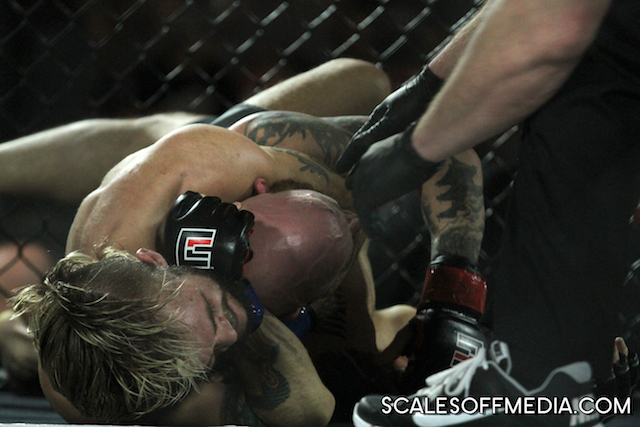 Aside from a brief exchange from the full mount in the first round, neither fighter landed many significant strikes. Fleming seemed unsure of how to engage and struggled to time his overhand right, failing to score any real points in the process. 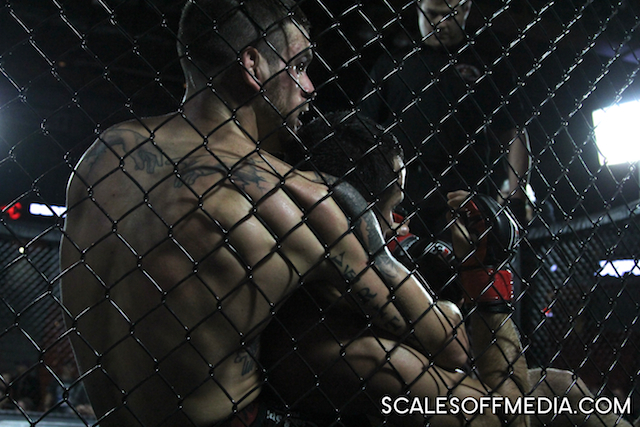 Galloway took to the center of the cage and kept jabs in Fleming’s face for the duration of the fight. Not a ton of action, but an undeniably intelligent game plan from Galloway, who coasted to the victory. The vast majority of this fight was spent working in the clinch against the fence. James was the clear aggressor throughout but was unable to get the separation he needed to really be effective on the feet, as Ware seemed content to defend using a tight over/under clinch until the final bell. Diehl dropped O’Connor early on in the first, and while O’Connor looked comfortable working out of danger on his back, Diel was ultimately able to pass into the full mount and land some heavy strikes. O’Conner turtled up to defend, and Diehl wasted no time locking up a body triangle and finishing him with a deep rear naked choke. The co-main event of the evening featured yet another first round finish. After backing Correa into the cage, Hough unloaded an absolutely devastating knee to his opponent’s head. Correa went down instantly, and it was all over. The main event was a war from start to finish. Ward and Trujillo both sustained an impressive work rate throughout the contest, mixing dynamic striking with savvy grappling. Two big takedowns from Ward in the first and third rounds were likely the real difference makers on the scorecards, but this fight gave us some glimpses at makes Ward such a promising up and comer. His special awareness in the cage and ability to scramble will take him far in this game. There’s been a lot of speculation of late as to whether or not a jump to the UFC is in Ward’s future; last night he showed why such rumors are justified. Apologies for the mix up, Daniel. My encyclopedic knowledge of Urban Philosopy occasionally leads to crossed wires. Great finish!